During an Amateur Athletic Union (AAU) swim meet, Duke Paoa Kahinu Mokoe Hulikohola Kahanamoku broke the world record in the 100-yard freestyle swim by 4.6 seconds in Honolulu Harbor on August 11, 1911. Officials were so incredulous at his time that the AAU would not recognize his feat until many years later. 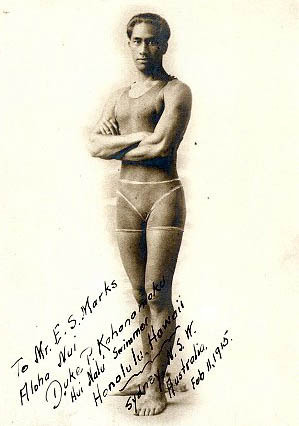 Duke Kahanamoku swam using a unique combination of an Australian crawl stroke with a flutter kick to add speed. Known as Duke, or the Duke, he was a three-time Olympic gold medal winner. He broke another record and won a gold medal for the 100-meter freestyle swim at the 1912 Stockholm Olympics where he also won a silver medal in the 200-meter relay event. The 1916 Olympics were not held because of World War I. Kahanamoku broke his own record at the 1920 Olympics in Antwerp, winning gold in both the 100-meter freestyle and as a member of the U.S. 800-meter-relay team. At the 1924 Olympics in Paris, he won a silver medal in the 100-meter freestyle (his brother, Samuel Kahanamoku, won the bronze medal and Johnny Weismuller captured the gold). Kahanamoku also was an alternate member of the U.S. water polo team that won a bronze in the 1932 Los Angeles Olympics. The name "Duke" is not a title, but a given name. He was named after his father, Halapu Kahanamoku, who was christened "Duke" by Bernice Pauahi Bishop in honor of Prince Alfred, Duke of Edinburgh, who was visiting Hawaii at the time of the elder man's birth in 1869. The younger "Duke," as eldest son, inherited the name. Growing up on the outskirts of Waikiki (near the present site of the Hilton Hawaiian Village), Kahanamoku spent his youth as a bronzed beach boy. It was at Waikiki Beach where he developed his surfing and swimming skills. In his youth, Kahanamoku preferred an old-school (traditional) surf board, which he called his "papa nui", constructed after the fashion of ancient Hawaiian "olo" boards. Made from the wood of a koa tree, it was sixteen feet (4.8 m) long and weighed 114 pounds (52 kg). The board was without a skeg, which had yet to be invented. In his later career, he would often use smaller boards, but always preferred those made of wood. On August 11, 1911, in an amateur swim meet, Kahanamoku was timed at 55.4 seconds in the 100 yard (91 m) freestyle, beating the existing world record by 4.6 seconds, in the salt water of Honolulu Harbor. He also broke the record in the 220 yd (201 m) and equaled it in the 50 yd (46 m), but the Amateur Athletic Union (AAU), in disbelief, would not recognize these feats until many years later. 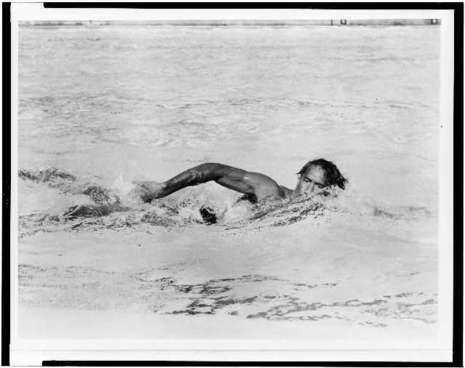 The AAU initially claimed that the judges must have been using alarm clocks rather than stopwatches, and later claimed that ocean currents aided Kahanamoku.